Dozens of big U.S. corporations are considering leaving the United States in order to reduce their tax bills. But they'll be leaving the country only on paper. They'll still do as much business in the U.S. as they were doing before. The only difference is they'll no longer be "American," and won't have to pay U.S. taxes on the profits they make. Okay. But if they're no longer American citizens, they should no longer be able to spend a penny influencing American politics. Some background: We've been hearing for years from CEOs that American corporations are suffering under a larger tax burden than their foreign competitors. This is mostly rubbish. It's true that the official corporate tax rate of 39.1 percent, including state and local taxes, is the highest among members of the Organization for Economic Cooperation and Development. But the effective rate -- what corporations actually pay after all deductions, tax credits, and other maneuvers -- is far lower. Last year, the Government Accountability Office, examined corporate tax returns in detail and found that in 2010, profitable corporations headquartered in the United States paid an effective federal tax rate of 13 percent on their worldwide income, 17 percent including state and local taxes. Some pay no taxes at all. One tax dodge often used by multi-national companies is to squirrel their earnings abroad in foreign subsidiaries located in countries where taxes are lower. The subsidiary merely charges the U.S. parent inflated costs, and gets repaid in extra-fat profits. Becoming a foreign company is the extreme form of this dodge. It's a bigger accounting gimmick. The American company merges with a foreign competitor headquartered in another nation where taxes are lower, and reincorporates there. This "expatriate" tax dodge (its official name is a "tax inversion") is now at the early stages but is likely to spread rapidly because it pushes every American competitor to make the same move or suffer a competitive disadvantage. For example, Walgreen, the largest drugstore chain in the United States with more than 8,700 drugstores spread across the nation, is on the verge of moving its corporate headquarters to Switzerland as part of a merger with Alliance Boots, the European drugstore chain. Founded in Chicago in 1901, with current headquarters in the nearby suburb of Deerfield, Walgreen is about as American as apple pie -- or your Main Street druggist. 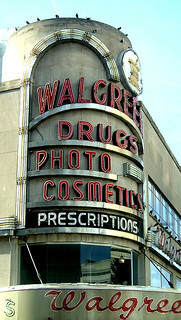 Even if it becomes a Swiss corporation, Walgreen will remain your Main Street druggist. It just won't pay nearly as much in U.S. taxes. Which means the rest of us will have to make up the difference. Walgreen's morph into a Swiss corporation will cost you and me and every other American taxpayer about $4 billion over five years, according to an analysis by Americans for Tax Fairness.